Mount Ripinsky stands 3,600 feet above downtown Haines. 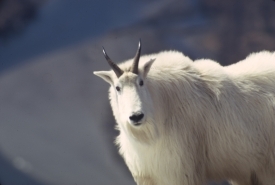 Alpine habitat near the top of the mountain is the primary home of mountain goats. Long hair and nimble footwork allows goats to thrive in the chilly alpine, where the steep, rugged terrain offers protection against predators. In the late spring and early summer, bears head for higher elevations to feed on emerging plants. Blue grouse, gray-crowned rosy finches and mountain chickadees are some of the birds found on Mount Ripinsky. As you ascend the trail, forest habitat gives way to alpine around 3,000 feet. Increase your chances of spotting wildlife by hiking the ridgeline between the Mount Ripinksy Trail and the Seven Mile Saddle Trail, which descends to the Haines Highway at mile seven. This is an extremely long and challenging hike that should only be attempted by very fit hikers. The Mount Ripinsky Trail is a rugged and difficult hiking trail for fit and experienced hikers only. Read the “Haines is for Hikers” guide (available at the Visitor’s Bureau) for more information and hiking safety tips before setting out, and let someone know when you plan to return. The trailhead for the 3.5-mile Mt Ripinsky Trail starts at the end of Young Road on the northeast edge of town.